You have been in camp for 16 weeks, you are desperate to fight so how do you get yourself through the last agonising few days before your bout. For Jamie McDonnell, it is all about day dreaming of his next holiday. 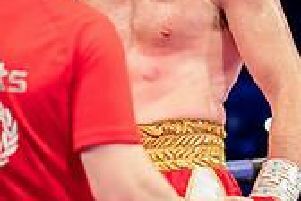 “Whenever I get a date set in stone I’ll start looking for the next holiday,” McDonnell said ahead of Saturday’s WBA title defence against Liborio Solis in Monte Carlo. “Once this fight in Monte Carlo was confirmed and announced, I got straight on the internet. I’m taking our lass and our daughter to Mexico, back to the hotel where we got married. “So when I get a bit frustrated or bored over the last few weeks before the fight, I’ll get on the internet and have a look at the place and what we can do while we’re there. Focusing on a holiday is a departure for McDonnell whose biggest mental niggle in the past was food. But he says bringing a nutritionist on board over the last year has made life much easier when it comes to eating during camp. He said: “I’d be a nightmare at this point with craving food but it’s been spot on in this camp. I’ve stuck to what the nutritionist has said when it comes to cheat meals but it’s really helped that the stuff I’ve been eating has been really tasty a lot of the time.